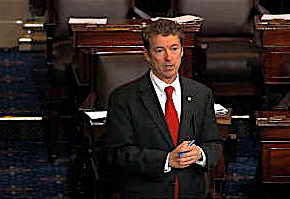 Sen. Rand Paul (R-KY), in all his glory on the Senate floor. Rand Paul, the junior Republican senator from Kentucky hasn’t had the best month. First it came to light that his director of new media, Jack Hunter, was a pro-secessionist zealot, who goes by the name of the Southern Avenger, wears a Confederate flag mask at personal appearances, and OH BY THE WAY, wrote that he feels John Wilkes Booth’s heart was “in the right place” in his killing of Lincoln. It took Sen. Paul a couple weeks to figure out that even though he liked Hunter, keeping around a guy with his proclivities for antagonism would be difficult to explain out on the campaign trail. Then came the vote last week to strip U.S. foreign aid to Egypt at a moment when this ally nation is suffering great internal unrest. Paul made his familiar isolationist argument about nation building here at home instead of overseas, after attempting to attach his proposal to a domestic spending measure. This shortsighted, short-reward viewpoint treats America like it operates in a vacuum, neglecting to take into consideration the message it would send if U.S. aid was suddenly stripped and the reverberation it would have across the Middle East. Sure the United States could keep that money and use it to restore some dilapidated bridges, but what happens when Egypt becomes destabilized and war breaks out across the region? What might that cost in terms of money and lives lost? In the hour-long debate that preceded the vote, Paul was given a taste of isolationism, as he was left to stand alone on the Senate floor. And it was Republicans who lined up to enthusiastically rebuke the Kentucky senator’s intention. 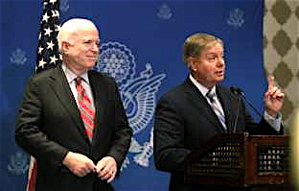 International foreign policy thinkers, Sen. John McCain (R-AZ) on the left, and Sen. Lindsey Graham (R-SC). When the clerk called the roll, Paul’s measure was crushed 86-13. It was a staggering rebuke for a supposed presidential candidate, especially when it came at the hands of his own party. A ferocious debate is emerging within the GOP over its vision and future. It’s pitting rising stars like Paul against other prominent figures like Christie and McCain. There will be no easy path to the White House in 2016, and Paul is starting to recognize this. After coming in postmortem on the 2012 presidential election, Paul spoke honestly about Romney’s defeat and how the GOP must be more inclusive. He wanted to open the proverbial umbrella, and extend the demographic nature of the Republican Party, or so he said. This led to Paul’s not so secretive ventures to Iowa and other places crucial to any aspiring presidential candidate. It may only be 2013, but traveling these byways without competition can only last so long. When it was discovered that Paul was scheduled to headline a routine fundraiser at the Women’s National Republican Club in New York this month, two Republican congressmen, Michael Grimm, who represents Staten Island, and Peter King, who represents part of Long Island, became furious that this Kentuckian was venturing onto their turf. 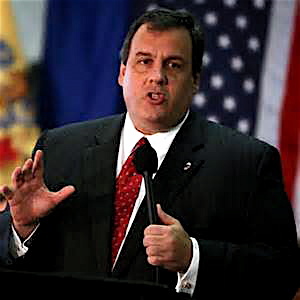 Paul, of course, has been a vocal critic of federal aid being provided to victims of Superstorm Sandy, saying that Gov. Christie and Rep. King were precisely the same people who are unwilling to cut the spending, and were seeking to maximize all the Sandy money they could get their hands on. It’s tragic when that bright light of clarity begins to shine down upon possible White House aspirants so far out from the election. From left: Sen. Paul, Sen. Mike Lee (R-UT), and Sen. Ted Cruz (R-TX). And this isn’t only Rand Paul. There is Sen. Ted Cruz from Texas, Sen. Mike Lee of Utah, and Sen. Marco Rubio of Florida. Two months ago Sen. McCain, the GOP’s 2008 presidential nominee, likened Sen. Cruz and Sen. Paul, and others, to “wacko birds” for their style of confrontational politics. The funny thing is, if I had read about this initially, I probably would have guessed it was the Tea Party that was causing the ruckus, but that is not the case. Finally long-standing, distinguished conservative thinkers on the right are calling out the fringe, and self-policing their lunacy before Democrats or editorial journalists have to get involved. Rand Paul can survive a statewide run in a place like Kentucky, the electorate is conservative and his message doesn’t filter out much past the Bluegrass and those in the Tea Party seeking validation. But put him in front of live microphones for days on end nationally, where he must answer pointed questions from knowing journalists – that will get ugly fast. Mainline Republicans have become fatigued with the obstructionism and empty rhetoric the Tea Party and far right are espousing, and appear tired of going back to their home states and attempting to defend or passively accepting these destructive arguments. Locally we saw some of this frustration spill out at Fancy Farm Saturday, the premier political event in Kentucky, where Sen. Mitch McConnell, the Senate Minority Leader, faced spirited attacks from his likely Democratic challenger, and from a Tea Party candidate who is challenging the five-term incumbent in the primary. 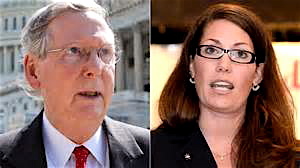 Sen. Mitch McConnell (R-KY), and his likely Democratic re-election opponent Alison Lundergan Grimes. The likely Democratic nominee to challenge him, Alison Lundergan Grimes, accused McConnell of not working with others in Washington, while Republican primary opponent Matt Bevin blasted him for what he said was an inability to stand up to Obama. “If Mitch McConnell’s doctor told him he had a kidney stone, he’d refuse to pass it,” said Grimes. Bevin delivered what may have been the sharpest attack of the day, urging McConnell to “be a man” and stand up to the president. “I don’t intend to run to the right of Mitch McConnell. I don’t intend to run to the left of Mitch McConnell. I intend to run straight over the top of Mitch McConnell and right into the U.S. Senate,” Bevin said in his speech. This sets up a wonderful situation for Rand Paul. He must decide whether he will back Bevin, the Tea Party candidate, who in all likelihood will get crushed by McConnell, or endorse the Senate Minority Leader and cold shoulder his Tea Party loyalists. The sound of Republican discord is echoing in Washington and through the trees of Kentucky. How the Tea Party and Reagan Republicans will handle this new stress in their relationship is yet to be seen, but no doubt loyalties will be tested. McConnell’s Senate race is the top election in 2014. 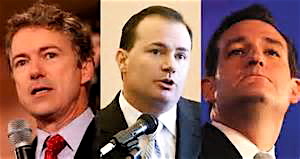 Quickly following it will be the open 2015 gubernatorial campaign in Kentucky, and then it’s Sen. Paul’s chance to renew his vows and run for re-election during what stands to be a hotly contested 2016 debate over who should next hold the keys to the White House. As the acrimonious tone amongst conservatives and the Tea Party grows, it becomes apparent neither side will sit by idly and be contented to wait for next time, and I for one will gleefully watch this internal power struggle unfold. Do remember to wear protective gear, this fight is going to get messy. This entry was posted in News and tagged Jack Hunter, Rand Paul, Tea Party. Bookmark the permalink.